Forty-plus years later it’s a moment Michigan State’s 1972 football team can celebrate despite an otherwise underachieving season that turned out to be their College Hall of Fame coach’s final season. The Spartans finished with a 5-5-1 record, but when the record had slipped to 2-4-1, Duffy Daugherty announced the night before facing Purdue he would retire at the end of what was his 19th season. Michigan State responded with a 22-12 win. Then, the Spartans made it two in a row with a 19-12 upset of unbeaten an No. 5-ranked Ohio State before 76,264 fans at Spartan Stadium. When the final seconds ticked off the clock, some students beat the players to Daugherty and carried him off the field; others tore down the goal posts. In the locker room, though, the Spartans didn’t forget their old coach. They gave him a game ball along with one for Boris Krijt, their kicker from The Netherlands who tied a Big Ten record with four field goals of 40, 31, 24 and 22 yards – and celebrated in the locker room with a cigarette. The game-winning touchdown was scored on a 6-yard run in the third quarter by a versatile safety that Daugherty had converted to quarterback. Most Michigan State football fans worth their green-and-white gear would guess Brad Van Pelt if asked to identify the 1972 athletic safety converted to quarterback to run the option, but they’d be wrong. 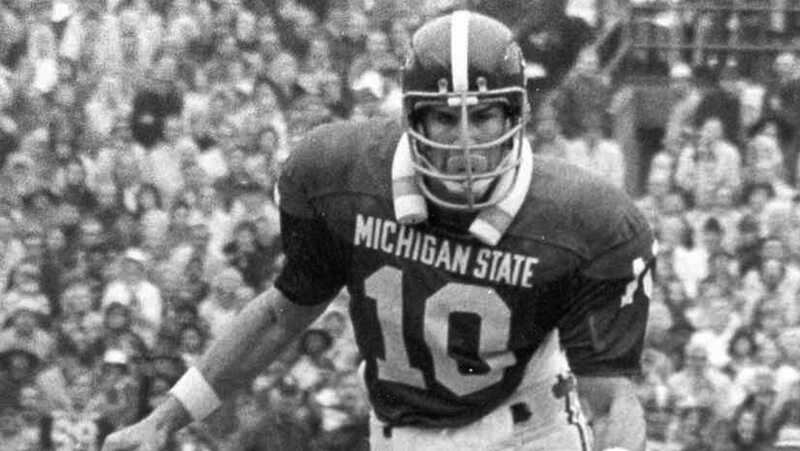 Van Pelt was a three-sport athlete and All-American safety, but Mark Niesen was the Michigan State defensive back that earned All-Big Ten honors on both sides of the ball. He was an honorable mention safety as a sophomore in 1971, honorable mention quarterback as a junior in 1972 and second-team All-Big Ten defense as a senior in 1973. “One of my old friends called me the other day to remind me of that,” Niesen said. Niesen returned home to careers as a teacher at Manistee Catholic and the building inspector for the City of Manistee, but he has fittingly kept active in retirement as a do-it-all handy man. He was the logical move to quarterback since the Spartans ran an option offense and he had been wishbone quarterback at Manistee Catholic. The Spartans started the season 1-1 with a win over Illinois and loss to Georgia Tech, but Daugherty had seen enough by the third game, an embarrassing 51-6 loss to eventual national champion USC at the Coliseum. Turnovers kept the defense on the field and Niesen said the unit was exhausted when he took a seat on the bench late in the game. The lack of quarterback play doomed a team that otherwise had 11 All-Big Ten honorees and 10 NFL draft picks. Years later Joe DeLamielleure, the Spartans’ All-American offensive lineman and Pro Football Hall-of-Famer, said upon Van Pelt’s death at age 57 in 2009 that the Spartans should have played Van Pelt at quarterback. At midseason, though, Niesen was the logical candidate to switch with his wishbone background. The move didn’t turn around the season, but it did deliver respectable performances in a 16-0 loss to No. 7 Notre Dame and 10-0 loss to No. 5 Michigan. For the season, the one-dimensional Spartans averaged only 14.4 points to rank 105thscoring in the nation out of 127, while the defense allowed 14.2 to rank 20th. With Niesen drafted into the quarterback role, he’s not sensitive to comments on his poor passing stats that included three touchdowns with eight interceptions. “I tell people I set a State record for tackles by a quarterback,” he said. But the Spartans finally lived up to their potential with the 3-1 finish. In the Ohio State game, Michigan State churned out 334 yards rushing, although the offense had to settle for those four field goals. With the score 12-12 in the third quarter, Michigan State went for a first down on fourth-and-1 at Ohio State’s 7-yard line, but Niesen was stopped by Randy Gradishar, the future College Football Hall-of-Famer. Three plays later, though, Michigan State’s Ray Nester forced a fumble that Bill Simpson recovered at the 6. On second down, Niesen scored when he kept the ball on the option around left end. The defense shut out Ohio State rest of the way. It was Michigan State’s first glimpse of Archie Griffin, who was a freshman on his way to back-to-back Heisman Trophies as a junior and senior in 1974 and 1975. He led the Buckeyes in rushing with 867 yards in 1972 – the first year the NCAA permitted freshman eligibility on the varsity -- but the Spartans held him to 11 carries for 42 yards. Over in the other locker room, the bombastic Hayes, a name that shares the Big Ten Coach of the Year Award despite a career as a bully, talked to the press without taking questions for what the Chicago Tribune reported was 14 seconds. With that, Hayes ended the interview. His Buckeyes went on to beat Northwestern 27-14 and Michigan 14-11 to win the Big Ten. They entered the Rose Bowl ranked No. 3 and lost to No. 1 USC 42-17. Ohio State’s upset loss to the Spartans was their last defeat in Big Ten play until the Buckeyes traveled to Spartan Stadium as the nation’s No. 1-ranked team and were shocked 16-13 on Nov. 9, 1974. For the record, Griffin was 1-2 at Spartan Stadium in a 40-5-1 career and 2-2 against Michigan State. Only USC, both times in the Rose Bowl, beat Griffin’s teams twice in those four years. For Michigan State’s 1972 players, the Ohio State upset softens disappointing memories. John Shinsky was a defensive lineman from Cleveland St. Joseph who earned honorable mention All-Big Ten in the 1972 season. “Considering the fact that I was from Ohio, there is nothing more that I want to accomplish than to beat Ohio State," said Shinskey, a professor at Grand Valley State. "Archie Griffin was a great running back and Ohio State was undefeated. Our defense played exceptionally well and I was just so proud of our overall Michigan State team.